Chasing the Dark was a total surprise for me. Before I started reading, I wasn't so sure if it would be something I would really enjoy. I mean, I'm not typically a fan of mystery novels. However, I've been trying to branch out a little more, so I gave this a try. I can honestly say that I was very pleasantly surprised by how much I liked this book. I liked it so much, I found myself counting down the time until I was free to pick it up again. I will admit that it started out a bit slow, but MAN did it pick up! This was an uncorrected proof, which I could definitely tell, so I won't touch on all the typos and flubs throughout. It did throw me off at first, but once I got used to the typos and some of the abbreviations/slang, I got completely sucked into Joe's adventure. Joe is a very likeable kid. He really doesn't want any trouble, but he won't rest until he has answers. I was right there with him, wanting to know what happened the night his mother died. He didn't know where to look, but that certainly didn't stop him. He's quite good at deduction and I was really impressed with his skills. Sometimes when he got stressed out, he distanced himself by pretending he was watching the situation on television. He'd "change the channel" and I found that a really interesting character quirk. I guess that's one way to deal with things, right? He is smart, brave and a pretty dang good kid. Along with Joe, there were some other pretty great characters. First of all, I have to say that I love Oz! He's such an awesome dog. Oz rocks. Yuri, the guy Joe meets in the abandoned mansion is really intriguing and I wanted to know what his story was so bad. I don't want to spoil anything, but I can say that we do find out that mystery. One of my favorite human characters - other than Joe, obviously - was Nina. Joe meets her in the lair of a crime boss, Viktor Kozek. Viktor is a seriously bad guy, but Nina and her family have no choice but to work for him to pay off a debt. She is full of fear, but she is more driven by her need to be free than giving into that fear. Nina is tough, smart, sneaky and very brave. She is exactly the kind of person Joe needs on his side in order to succeed. I just loved her to bits. Another character I liked a lot was Joe's best friend, Bailey. Though he's not in the story as often as I would have like, Bailey - and Oz, as a matter of fact - brought some much needed comedy to the team. He was also quite tech-savvy, which was very helpful for Joe and his mission. There were some characters that I would definitely not want to run into. As I mentioned before, one of those characters is Viktor Kozek. He's a seriously bad guy. He's like a Ukrainian crime boss and a take-no-prisoners type of guy, so you can only imagine how terrifying having to deal with him would be to a young teenage boy. Viktor's cronies were also quite fiendish, but none of these were as scary as the main villain in this story. It would be super spoilery if I told you who that is, so I won't. Just know that this individual is ruthless and even Viktor and his men are scared to cross them. I really enjoyed Sam Hepburn's writing style, once I got used to it. The settings were vivid and interesting and she was able to pace everything so perfectly. Except for at the very beginning, I didn't feel like it dragged or was too fast. The pace made it so that I simply HAD to find out what was going on! I call that a success, really. There are so many questions that cropped up as I was reading. What happened to Joe's mom, Sadie? Who was Ivo Lincoln, the guy she was in the car with when they were run off the road? Who killed them and was it really and accident? How does Elysium fit into the mystery? Does it at all? Who is to be trusted and who isn't? Will Joe make it out alive? I am really pleased to say that all my questions were answered by the end. Sam did a great job tying up all the loose ends and I closed the book extremely satisfied. There is a ton of action, suspense, danger and even a twist at the end that I didn't see coming. 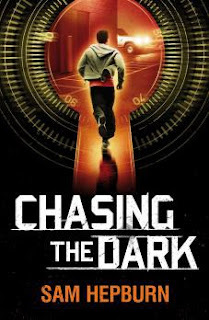 Overall, Chasing the Dark is a very interesting, action-packed, riveting mystery that is bound to thrill readers young and old.